The scoreline was the same as last season but the feeling was completely different. When Manchester United pegged back Burnley’s two-goal advantage at Old Trafford in December 2017 there were groans and disgruntlement, this time around the same scoreline was played out to cheers and roars. Despite Ole Gunnar Solskjaer’s perfect record in interim charge falling at the ninth hurdle, this match was yet more evidence that Old Trafford has got its United back. United’s string of wins could not go on forever and this was the first time that interim coach Solskjaer experienced the feeling of dropped points. But given that the home side were two goals down with little more than two minutes of normal time remaining, this was a case of one point feeling like three. It was the type of performance – featuring a rather blunted attack in the first half coming up against a weathered and sturdy Burnley defence – accompanied by a spectacular finish. One that United supporters were once so accustomed to; earning a point in this fashion only confirms that the club is on the right path. Greater character, increased resilience, more confidence and a never say die attitude is what United have cried out for in recent times. The players now appear to be stepping up to wearing the shirt that can at times weigh heavy on the shoulders. Snatching away Burnley’s chance of a first victory at this historic stadium since 1962 in such late circumstances was cruel but also telling that Solskjaer’s United don’t give in lightly. Solskjaer has been bold since taking the reins at United and placing Andreas Pereira into the starting lineup certainly raised a few eyebrows. A few more were raised when shortly after half-time the Brazilian playmaker stuttered and dithered with the ball close to his own area before slipping and allowing Ashley Barnes to put Burnley into a shock lead. This was the first time that United had been behind under their caretaker coach. Was selecting Pereira a case of Solskjaer trying too hard to make changes? Given that Burnley were anticipated to sit deep for much of the match, the coach’s selection seemed a sensible choice to bring greater creativity to United’s midfield. However, Sean Dyche’s side were much more attack-minded and expansive than expected. The visitors were not shy in coming forwards and along with a default shape that frustrated United, the first half was one of the toughest in Solskjaer’s reign thus far. Burnley put in a shift that not only limited United in front of goal but also gave them food for thought close to their own goal. The hosts missed the combat and energy of Ander Herrera; naturally forsaking an element of creativity, the Spaniard was exactly what United needed to turn play over and propel the team forward. Yet Dyche’s men were up for the fight and when Ashley Westwood clipped a cross for Chris Wood to head past David De Gea, the Theatre of dreams was shocked. United had garnered what felt like 20 minutes of constant possession prior to Burnley doubling their lead in the 81st minute and it was during this spell that the visitors showed their mettle to hold on. Tom Heaton who has been in impeccable form since returning to the team with only two goals conceded, kept his side in it to the last here with one particularly eye-catching save to deny an Alexis Sanchez header. James Tarkowski was stubborn and led the Burnley defence with aplomb. However, at full time it must have felt like all in claret and blue had just come off the waltzer such was United’s unrelenting pressure in the second half. Considering that Burnley had been on the receiving end of a 5-0 drubbing at Manchester City in the FA Cup on Saturday, travelling across town to face the more in-form Manchester club would have seemed a daunting proposition. But Dyche’s side continued to show signs of the mini-renaissance that they have been experiencing in the league. It was credit to Burnley that they were able to hang on for so long but in the first half especially Solskjaer’s side lacked the cutting edge that they have shown of late. Marcus Rashford snatched at a couple of chances and poked a good chance wide whilst one-on-one with Heaton whilst Romelu Lukaku was substituted early after a stuttering performance. United were unable to find an equaliser during a period in which they heavily dominated, but once Paul Pogba scored from the spot all inside the stadium could see what was coming next. 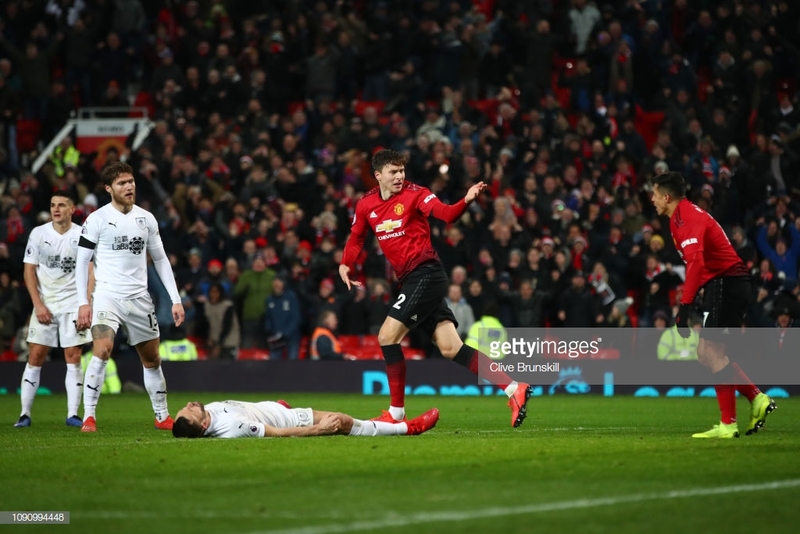 That is in part down to the atmosphere which Solskjaer has reinvigorate here; there was no cowing or reluctance to attack and eventually, they got their reward. The finale was dramatic and when Victor Lindelof struck United’s equaliser, thoughts automatically turned to a possible winner. The fact that it didn’t come and still the home crowd roared at the final whistle only shows how this club has altered since this fixture 13 months ago. The fightback felt like a throwback, though it’s part of the advancement of United under Solskjaer.